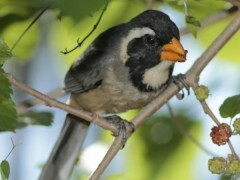 There are three saltatos at Costanera: the Golden-billed Saltator Saltator aurantiirostris, the Greyish Saltator Saltator coerulescens and the Green-winged Saltator Saltator similis. The two saltators which cause confusion are the Greyish and Green-winged ones. 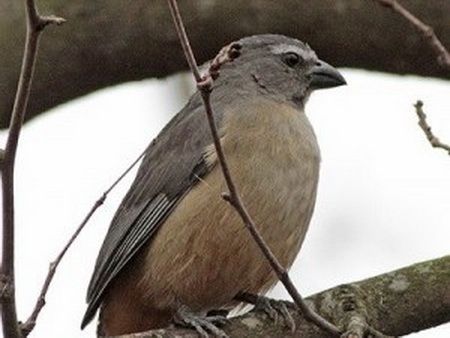 The Green-winged Saltator (19 cm) is more frequently seen at Costanera, the Greyish one (20 cm) appears with no definite seasonality. These two birds are quite alike, practically the same size and same type and colour of bill. The eyebrow is the identification key. These two birds are quite alike and almost the same size, same type and colour of bill. The eyebrow is the identification key. In both it begins at the bill base and its length gives the answer of who is who. 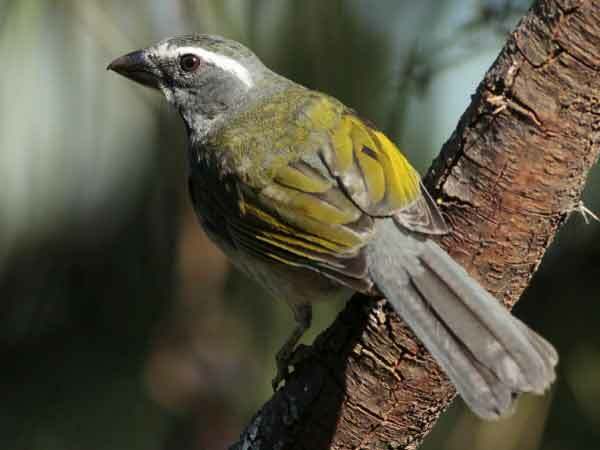 That of the Greyish Saltator barely goes beyond the eye. That of the Green-winged Saltator runds down the neck. The olivaceous green on the wing and upperparts is exclusive to the Green-winged Saltator, as the name indicates. But confusion does not end here. Our third saltator is the Golden-billed Saltator, a resident bird which breeds at Costanera. The adult is easily differentiated from the other two. The white eyebrow, which begins over the eye and runs down the neck, is not paid attention to, because the orange bill and the collar enclosing the white throat remove all doubt at once. 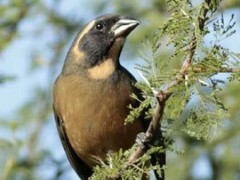 But the Golden-billed Saltator juveniles have a black bill and no collar during a stage of their growth. And again we come back to the eyebrow. The juvenile's eyebrow also begins over the eye but unlike the adult's is buff.